The Croydex bath mat uses slip resistant rubber or PVC and phthalate free materials. You probably have a slippery bath or slippery shower with nothing to hold onto. Imagine life should you break a bone. If you have poor balance or you are not steady on your feet then give a non-slip mat for the shower or bath careful consideration. It helps to make life easier. It provides grip for the feet so less chance of a silly fall. Just think of the serious consequences if you have a fall or take a tumble and hurt yourself. It might be sensible to have a shower suction handle. 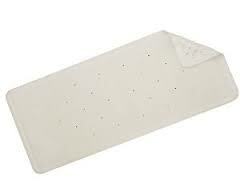 The natural rubber bath mat is not only easy to look after because it is machine washable but it is also treated with the Hygiene ‘N’ Clean treatment at the time of manufacture. This treatment cuts down the chances of the bacteria occuring. This can degrade products and generate unpleasant smells. Remember that Croydex bath mat is easy to clean and it is machine washable. It has secure grip suction grips. Most important it is slip-resistant. Simply click Croydex bath mat to find ot more. The bathmat will not slip and most importantly, YOU will not slip!